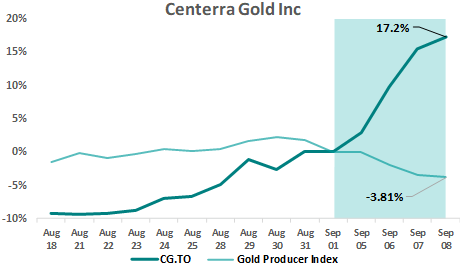 The political tension between the Kyrgyzstan government and CG, the majority-owner and operator of the largest gold mine (Kumtor) in Kyrgyz Republic, has been high. For more than two years, CG and the Kyrgyzstan government have been in a dispute over Kumtor’s structuring as the government demanded a change from the original majority-minority structure to a 50/50 JV. In May 2016, the court ordered CG to pay about $98mm in fees related to their mine waste. This fine came less than a month after prosecutors raided CG’s offices to collect documents related to a separate criminal case alleging financial violations by the firm. Almost right after CG sought international arbitration from the UN, Kyrgyzstan authorities opened a criminal probe against managers at Kumtor. Additionally, the environmental agency asked CG to pay $220mm related to pollution at Kumtor. More importantly, a financial freeze was put on CG’s subsidiary that owns the Kumtor mine, prohibiting the subsidiary from transferring assets or paying dividends back to CG (but conveniently, the subsidiary is allowed to use its cash resource to keep the Kumtor mine running). Some good news finally came out on September 6, 2017 – the Kyrgyzstan media reported (which has been subsequently confirmed by CG) that the discussion between CG and the Kyrgyzstan regarding the settlement of all outstanding disputes has reached an advanced stage. The bottom line is that CG needs to transfer more wealth to the Kyrgyzstan government. However, the positive side is that with the financial freeze lifted, CG has access to Kumtor’s cash and can use it to diversify into politically safer jurisdictions. 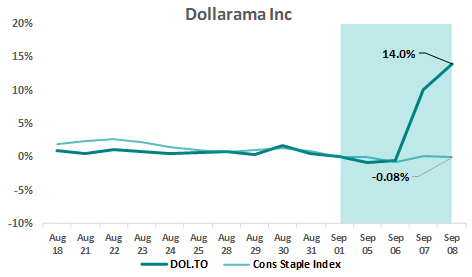 It’s just amazing how DOL is able to exceed expectation when the market already knows that DOL is going to exceed expectation (i.e. the street consensus was above management guidance to start with). 2Q2018 SSSG% was 6.1% (vs. 5.1% consensus), driven by 5.9% growth in average basket size (a.k.a. ticket growth) and a 0.2% increase in traffic. The basket size growth benefited from the introduction of $3.50/$4.00 price points (yes, DOL hasn’t been a true “dollar store” for a while). FY2018 gross margin guidance was revised upward by 50 bps to 38.0-39.0%, and by extension the EBITDA margin guidance also improved. 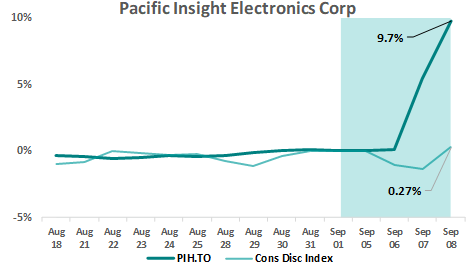 As previously discussed in this weekly blog, PIH has agreed to be bought by Methode Electronics (MEI) for cash consideration of $18.50/share. On September 6, 2017 Shenzhen Kaizhong Precision Technology announced that it’s willing to pay $24.35/share for PIH, 31.6% premium above MEI’s bid. Since MEI’s bid is still subject to shareholders approval and it’s scheduled to be voted on by PIH shareholders on September 26, 2017, the stock jumped to $20.04 pricing in the probability that the shareholders will reject MEI’s lower bid. When you routinely disappoint the market, an in-line news is positive for the stock. NGD’s major development project, Rainy River, is frequently subject to delays and funding gaps. Back in January 2017, NGD stock crashed when the company announces that the expected first production was delayed by three months and as a result the capital cost increased by $195mm. NGD subsequently cleared the funding gap overhang with a dilutive equity raise. The recent Rainy River project update on September 6, 2017 was reassuring since basically project schedule and capital cost remain in line with the updated plan announced back in January. 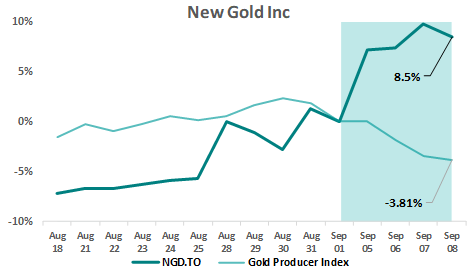 NGD is on schedule to start processing ore in mid-September and achieve commercial production in November, while keeping the capital cost of $515mm unchanged. In 2013 Twitter’s IPO filing gave Tweeter Entertainment (ticker: TWTRQ) a 700% boost in one day. 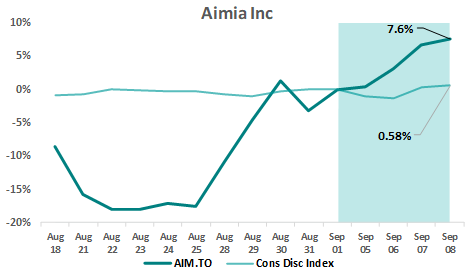 On September 7, 2017 AIM popped +6.0% most likely due to the same ticker confusion incident because on the same day “AIM1 Ventures” (a capital pool company traded on TSX Venture) completed its IPO and Canada NewsWire actually mistakenly coded the news to AIM. Sometimes management will raise capital opportunistically to increase its war chest when the stock has been on a good run. HBM up +22.0% in less than a month certainly qualifies as a good run, so post-market on September 7, 2017 HBM came to the market with a $242.4mm bought deal at a 6.0% discount. 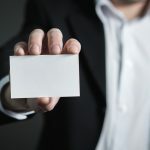 The market typically penalizes these opportunistic capital raises because they are purely dilutive to existing shareholders (unless it removes an overhang such as a very leveraged balance sheet with near-term maturity). HBM closed 4.4% below the deal price of $10.10 means that the market didn’t take it so well. 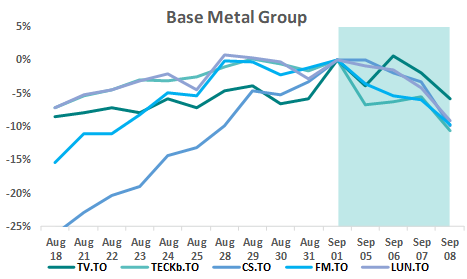 After a huge recent run up, there are finally some profit-taking in the base metal producers. 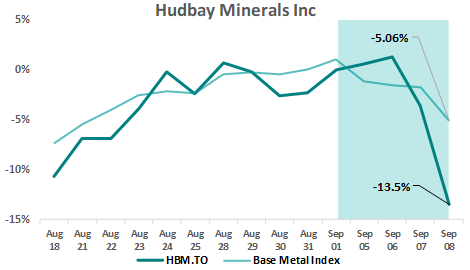 The synchronized decline on Friday might have something to do with the HBM equity raise as PMs often raise funds by selling names in the same industry to participate in the bought deal. 1Q2018 revenue of $ 84.0mm and EBITDA of $5.3mm significantly missed expectation. 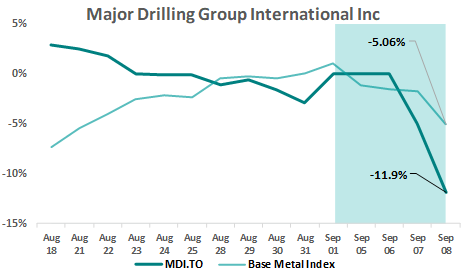 While the management is citing an improvement in activities, MDI’s utilization rate is depressed and without a pick-up in utilization, pricing is going to remain weak. Consequently, the path to improved margin remains unclear. As a drilling service company to the mineral exploration industry, MDI’s utilization and contract pricing are ultimately dictated by the capex budget set by the junior and major mining companies. With gold price and most base metal prices at multi-year highs, MDI’s long-term path to recovery is probable. However, as the annual capex budgets are set towards the end of the calendar year, MDI’s stock price is likely to remain pressured in the near term. 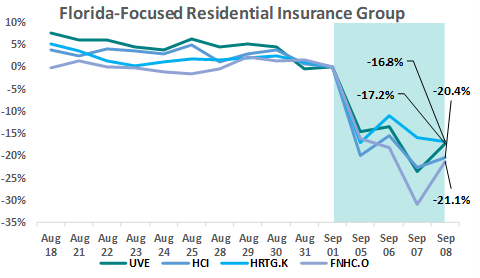 Residential property insurance companies with a Florida connection lost about 20% of their total market cap as Hurricane Irma, the most powerful Atlantic Ocean hurricane in recorded history, is expected to sweep through Florida. Next in line are the reinsurance companies as they routinely provide catastrophe insurance exactly like Hurricane Irma. 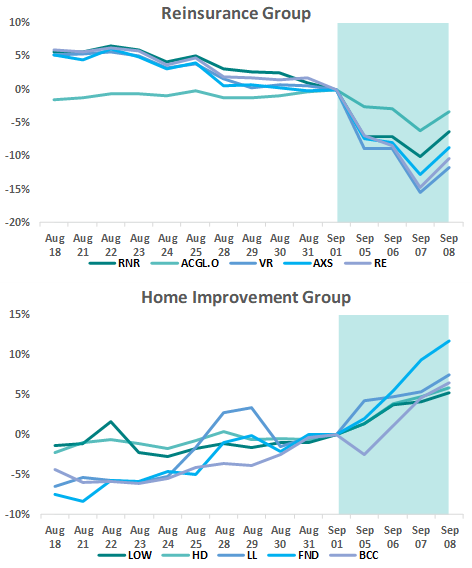 On the flipside, companies that are in the home improvement business are seeing their stock prices running up as numerous homes will need to be repaired in the aftermath. 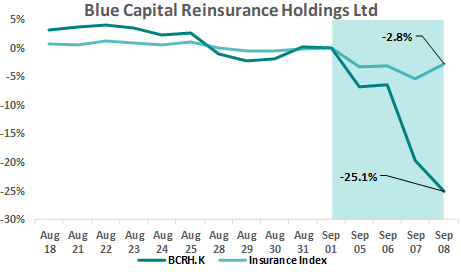 BCRH provides collateralized reinsurance in the property catastrophe market. Investors of BCRH shouldn’t be surprised by the 25% drop as BCRH is set up for the sole purpose of assuming tail risk like Hurricane Irma. This is exactly the payoff of a short-vol portfolio should look like – during non-crisis times, the investors enjoy the nice positive carry. But when the tail-event materializes, the investors take a huge capital loss.